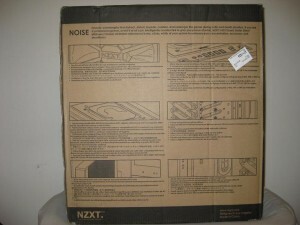 One of the most important aspects of a PC case outside of having the components they use fit or good airflow is noise. NZXT has given us one of their mid-tower cases, named the H2 Classic, which aims to curb some of the sounds that come out of our PC. 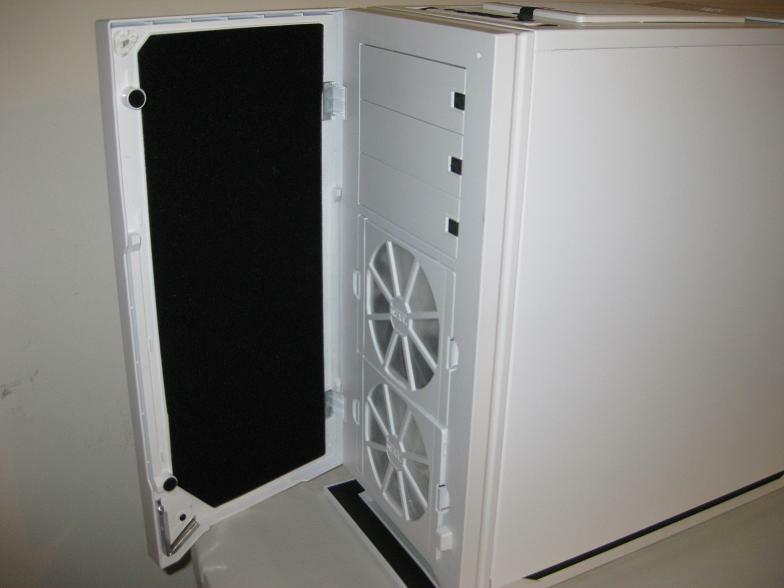 This case has features such as foam padding on both the side panels and front panel, quiet 120 mm fans, as well as using rubber grommets around the mounting points for the hard drives isolating their vibration from the case. If we put all of that together, it sounds like it would be more effective than a case without those features. 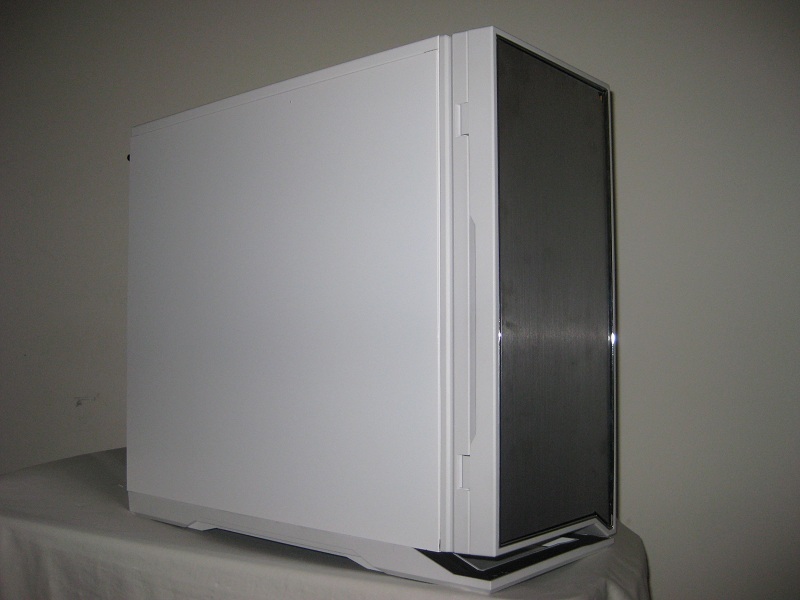 Cracking open the information riddled box (which is a good thing) for the first time revealed a glossy white mid-tower case with a brushed aluminum front panel that opens to reveal two 120 mm intake fans and the optical drives. White would not be my personal choice, but it really does give off a classy and clean perception. 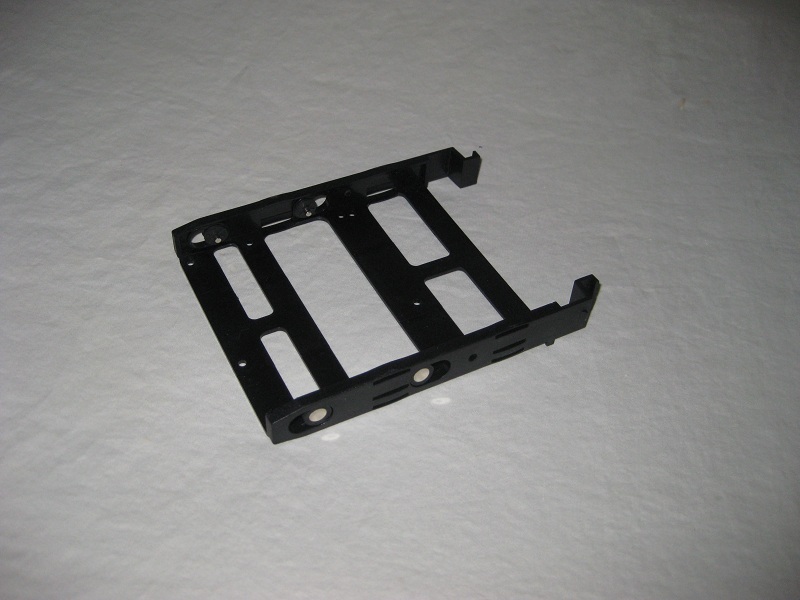 This case is also available in black as well. Front Panel open showing intake fans and the foam sound proofing material. 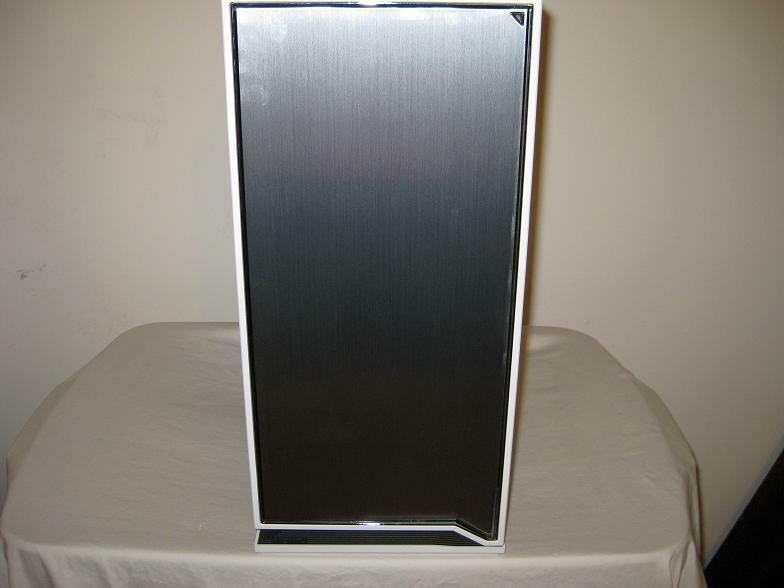 On the inside of the case, you can see the almost Othello like (board game) black and white color scheme. 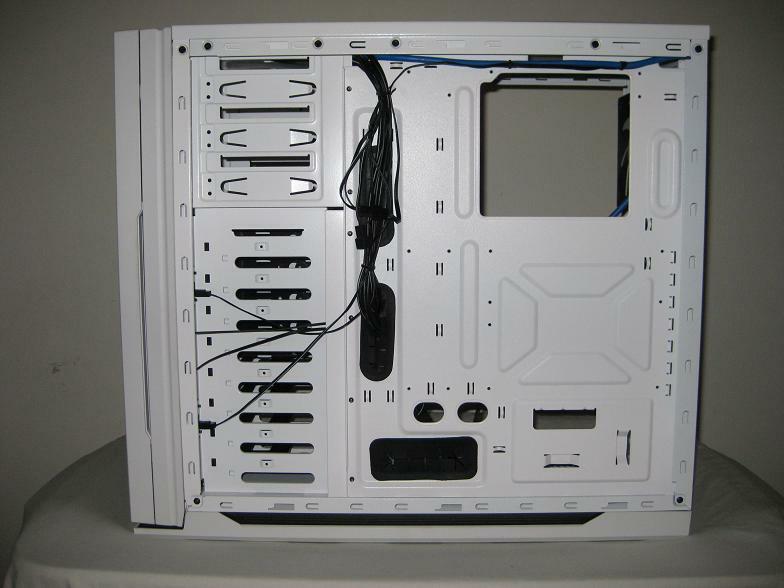 There are plenty of cut out rubber grommets to route your wires to the back of the case as well. Also pictured are the 1200 RPM fans that came with the case (3 total). On the back side, there are plenty of areas to route and hide wires. Also pictured is the now obligatory motherboard cutout to be able to mount the CPU heatsink which has plenty of room for the major socket types. 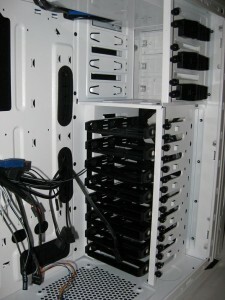 Notice there are 8 HDD trays. Plenty for most enthusiasts. 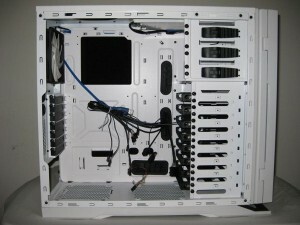 Internal rear showing fan, PSU cutout and peripheral cutouts. 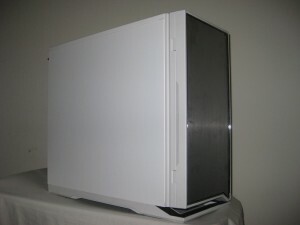 On top of this case is a pretty unique feature, a hot swap capable SATA HDD Dock (which does require an AHCI capable motherboard and hot swappable HDD). Though it may be out there somewhere, I have never seen that feature on a case before, especially one in this price range ($99 MSRP). You can also see the area for the 140 mm rear exhaust fan (not included). 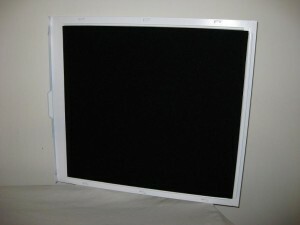 Also pictured is the panel showing off its foam cladding to aid in sound suppression. 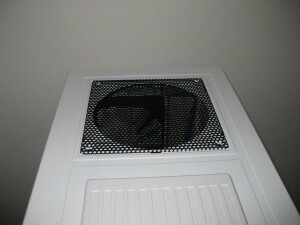 Lastly, you can see the bottom intake dust filter for the PSU and optional 120 mm intake fan area. Top of case with covers on. 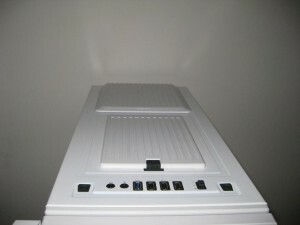 Hot swappable HDD bay on top of the case. Top exhaust fan (without magnetic cover). Bottom of the case, dust filter. 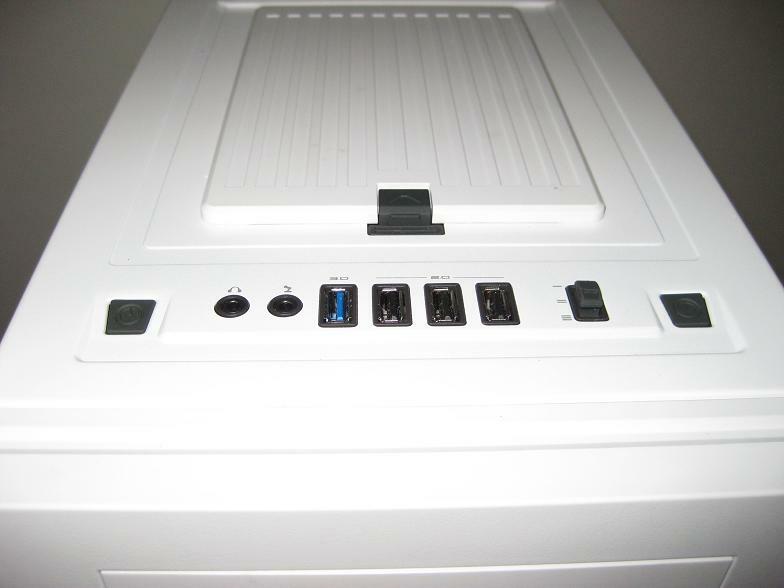 Here you can see the top I/O panel with its USB3.0 capability, headphone/microphone, three USB2.0 ports as well as the 30 W, three channel fan controller which has settings for 40%, 70%, and 100% fan speeds. 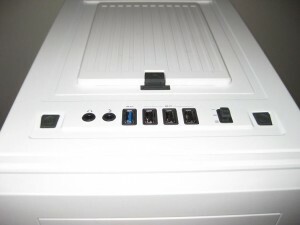 Top panel I/O (Power/Reset, Headphones/Mic, 1 USB3, 3 USB 2 ports, fan controller). 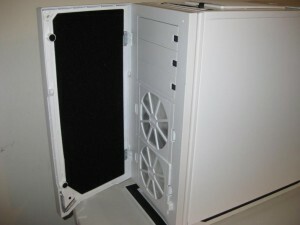 Inside the case are the plastic hard drive cages that have rubber mounting grommets for the 3.5″ drives. These rubber mounting points absorb any vibration coming from your hard drives and help minimize noise. These plastic trays can also mount 2.5″ drives like SSD’s. 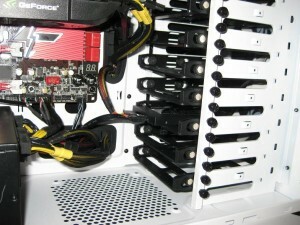 Hard drive cage with OCZ Summit SSD. Here is what it looks like with everything installed. The white sets off the internals a bit more to me. One thing that I liked to see on the technical specifications are the VGA clearance maximum and the CPU heatsink support. 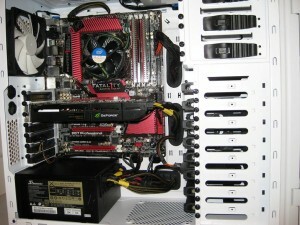 This information will tell you exactly how big your video card(s) and CPU heatsink can be. Chassis Specifications (Courtesy of NZXT). Installation was generally easy. 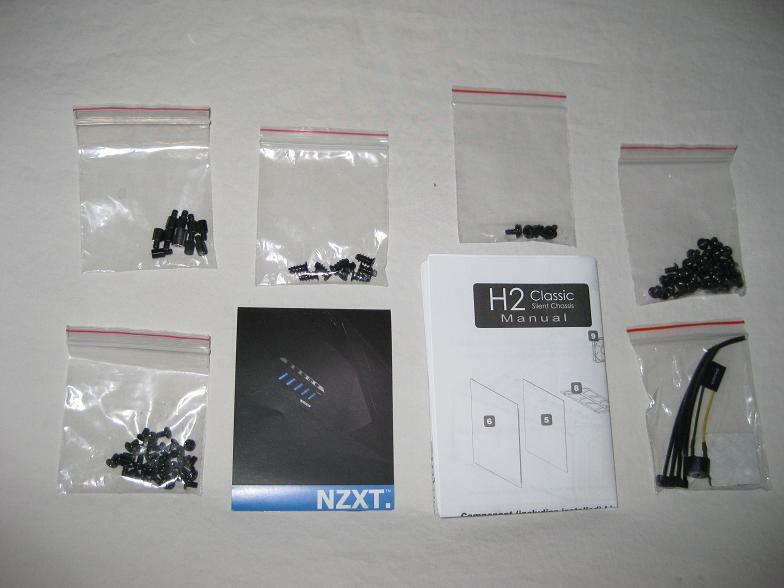 Placing the stand offs for the motherboard was particularly easy as NZXT gives you a small tool that assist in tightening them down. I used this tool in my interchangeable screwdriver and it worked like a charm. Heatsink placement is no problem at all with the large cutout on the back of the motherboard tray. Getting an optical drive in should be nice and easy as expected after sliding off the tool-less 5 1/4″ bay cover. Installing the OCZ Summit SSD was simple as screwing it down with the included screws on to the removable hard drive tray. 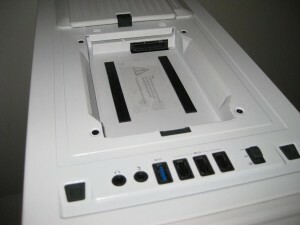 The hard drive tray fits securely in its slot. You know when its properly installed by hearing a nice ‘click’ from the tray. As NZXT states in the specifications, there is adequate space for a 12″ (305 mm) card with a few mm to spare (sans hard drive on that level of course). NZXT provides ample places for your wires to be hidden. There are three large grommeted holes to fish them through the back side and out of view. I have to admit I had a real problem with these. They just did not want to stay in their holes and were very easily pushed through. A tighter fitting grommet or maybe some glue around the edges would help that cause. The USB3.0 cord comes out of the rear of the case to use one of the external USB3.0 ports. This is not the most beautiful implementation of front panel USB3.0, but of course it does work. 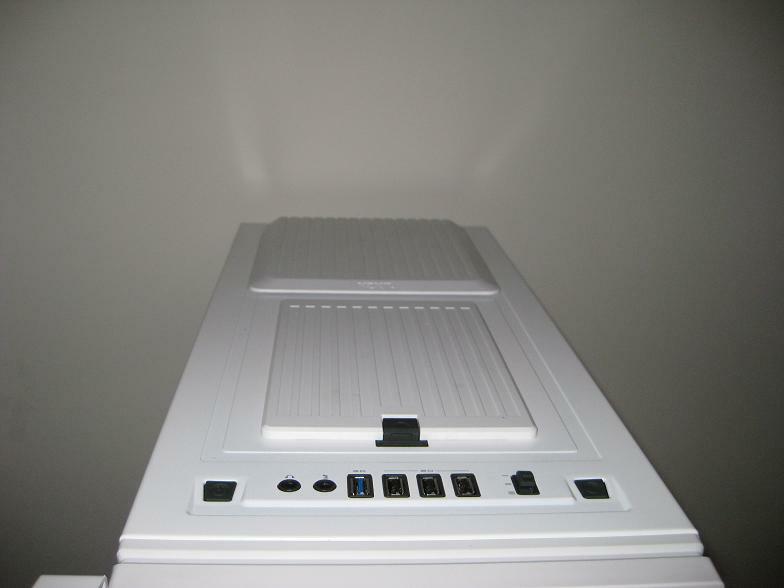 The front panel also contains a fan 30 W fan controller adjustable to 40%, 70%, and 100% speeds. 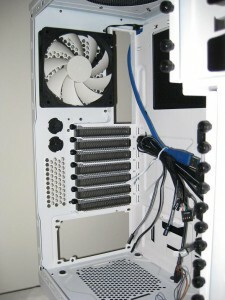 30 W and the three included adapters will allow you to run some powerful fans if you need too. 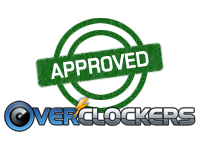 This works very well for the case fans and is a nice feature to have at this price point. Finally we can talk about sound. 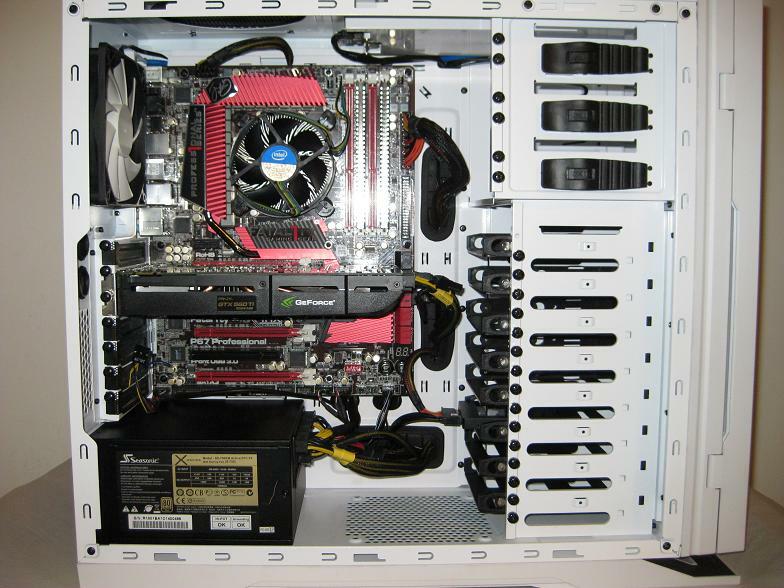 Running the case fans on 40% and the stock intel heatsink fan on automatic, I was pleased by how quiet this case was. I do not have the tools to give you a decibel reading, but I can tell you that it’s quieter than my 800D which is a large and expensive case. Granted this didn’t have any of the sound suppression features, but it was a very quiet case with its mix of 140 mm and 120 mm fans. 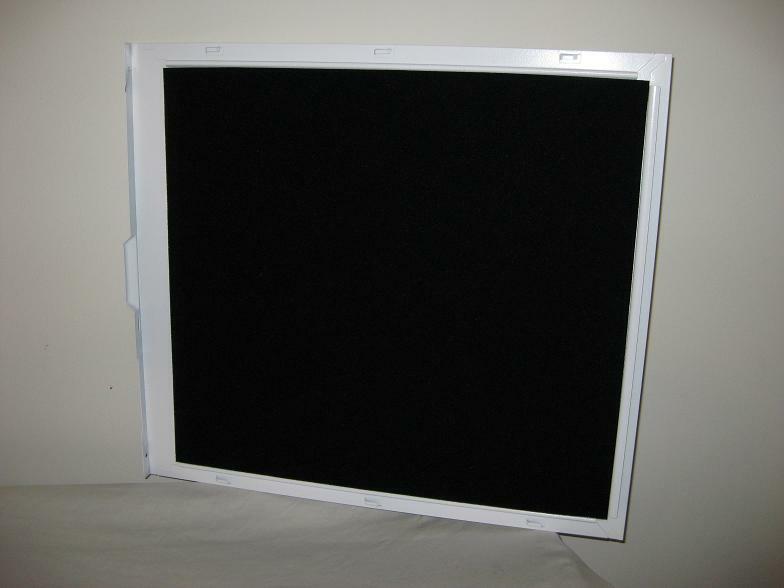 There is also that foam cover on the front panel as well. 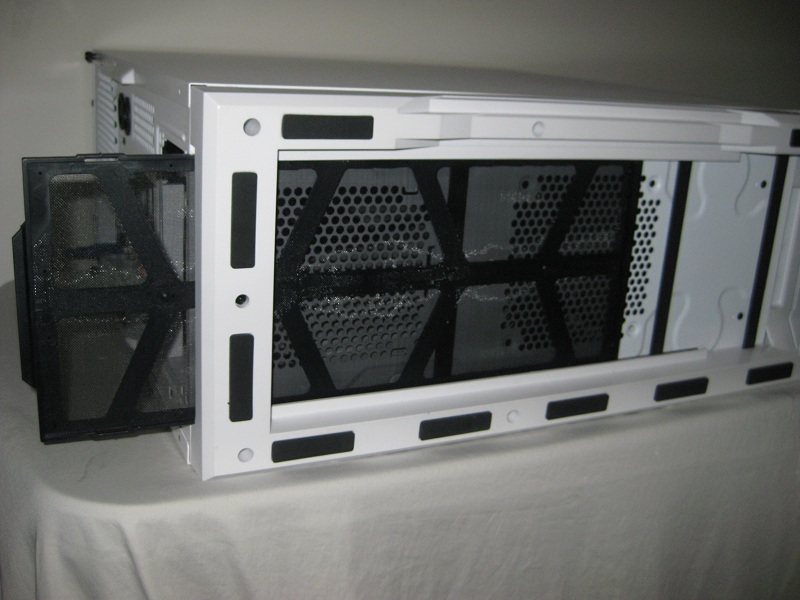 With the fans turned up to 100% and spinning at 1200 RPM, this case still was quiet. The fans were audible and provided plenty of airflow to keep my Sandy Bridge setup nice and cool with the stock intel heatsink; it was plenty cool even when nearly silent at the 40% fan setting. More airflow can never hurt, so I would suggest getting another 120 mm fan for intake on the bottom and filling the top 140 mm exhaust. Did the foam on panels work? Possibly, I can’t see how it hurts. It’s a nice feature at this price range regardless. 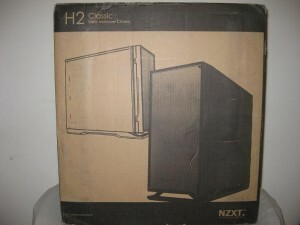 NZXT has set out to make this a quiet, inexpensive case with their H2 Classic line and have achieved it. I cannot test if the foam on all the panels or the rubber mounts for the hard drives worked, or if it was just quiet fans (they are!). The point is, in its stock form it was pretty quiet even up to 100% fan speeds. Having the ability to control the fans control on the top was quite a feature to have in the price range and I applaud that addition. I really only had one problem with this machine and that was with fighting the grommets. That should be taken care of with a tighter fitting grommet or some glue. With that minor quip aside, installation was easy being essentially tool-less and there is plenty of room inside the case for 12″ cards and 170 mm CPU heatsinks. The white color isn’t my style, but I can appreciate it’s a classy looking and quiet case. 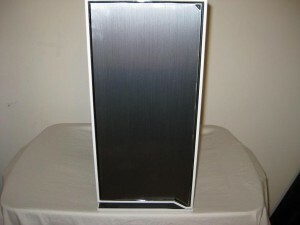 With an MSRP of $99.99 this case should be on your budget mid tower list for sure. It should be out on your store or e-tailer’s shelves soon! But in both cases i think it would have been more usefull to the end user if it was a 3.5" drive supported. That way 2.5 and 3.5" devices could be used. 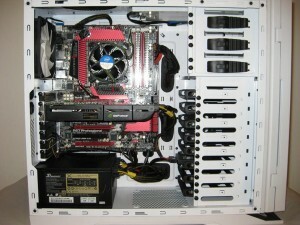 Top panel I/O, looks nice, once thing I think that could have been done better is E-SATA. Without the HDD dock supporting 3.5" drives, i think they missed the boat with that one. Also would be nice if they rotated the HDD cages 90 degrees. The layout they have makes it a pain to remove drives if PCI slots are populated. 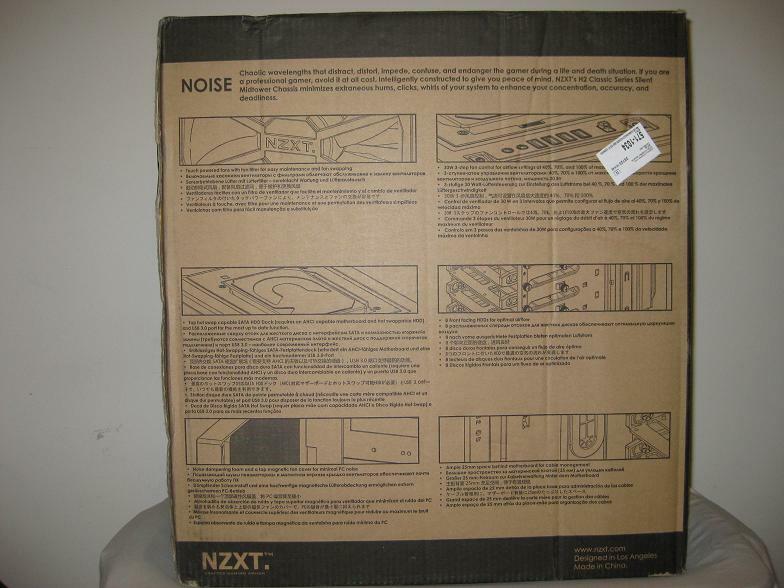 However what i would like to know is, how is the noise VS a Antec Sonata Case? I am a big fan of Silent PCs. Nice review! I really like the look of NZXT's new cases. Would you say this is the best case available in that price range?? Does anyone have any idea when these cases are set to hit the internet shelves? I've been looking everywhere, and all I can find is "sometime in April." There's also a black version of this though.. Which I think looks far nicer. It goes nicely with the white fans giving it that accent. But I've always prefered black over white in terms of cases.. My P180 Mini is the black version, not white XD. As far as best in its price range.. .Im not sure what every case is available in that price range... nut it should be up there with its neat feature set. I purchased this case for my new build that I built a few months back and can say i am very pleased with it. 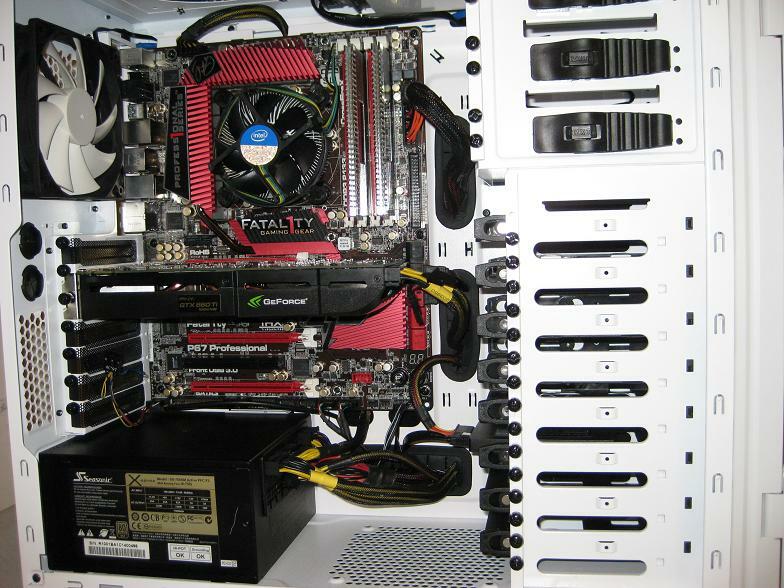 I used to be a fan-oholic and my old setup was on the loud side with the 10+ fans all running. My wife wasn't a big fan of the noise either. After building my new rig in this case I haven't heard a peep from here about noise and even at times i have to double check that I pressed the button when turning it on as it is that quite. For the price it was a no brainer for me to buy and now reading this review after i agree fully.